Jeff Lurie bought the Eagles for $185 million. They’re worth a lot more today. 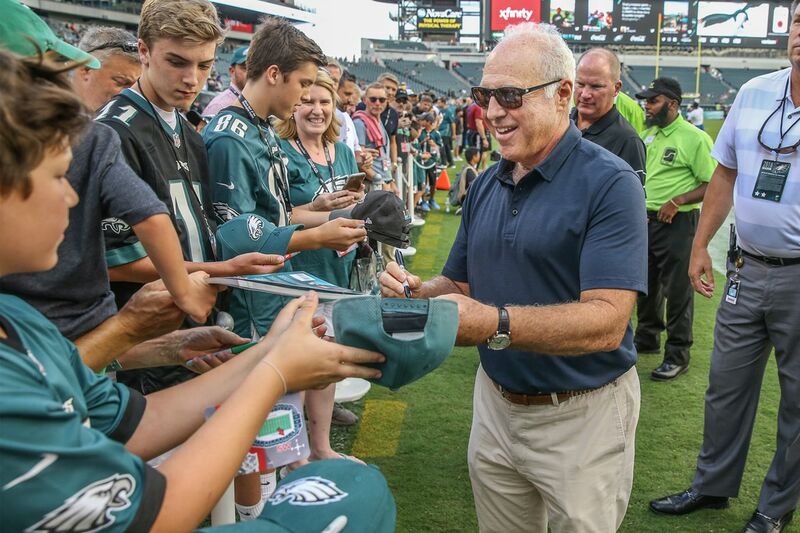 Philadelphia Eagles owner Jeffrey Lurie (right) signs autographs and chats up Eagles fans before the preseason game against the New York Jets on Aug. 30, 2018. Forbes released its annual list of the NFL's most-valuable teams on Thursday, and for the second year in a row the Eagles nabbed the 10th spot. According to Forbes, the Eagles are currently worth $2.75 billion, a four percent increase over last year's valuation of $2.65 billion. Forbes lists the team's total revenue at $458 million, with profits of $114 million (up from $63 million last year). The Eagles have a $163 million cash payroll in 2018, down from $174 million last season, according to spotrac. The Eagles certainly haven't been a bad investment for owner Jeffrey Lurie, who purchased the team from Norman Braman back in 1994 for $185 million, about $276 million in 2018 dollars. But despite the team's Super Bowl win, the Eagles remain the least-valuable franchise in the NFC East (and the only team with a value of less than $3 billion). For the 12th-straight year, the Dallas Cowboys topped the Forbes list, with a value of $5 billion. Just six years ago, the Cowboys were the only team Forbes valued at $2 billion. Now all but four NFL teams (the Cleveland Browns, Cincinnati Bengals, Detroit Lions, and Buffalo Bills) are all worth at least $2 billion. Overall, Forbes said, NFL team values have plateaued, increasing on average just 2 percent compared to last year, the smallest increase since 2010. Despite that, the NFL remains the most profitable league in the world, and could get even richer if it opts out of its Sunday Ticket deal with DirectTV. The NFL and DirecTV have four years remaining on the deal, which brings in about $1.5 billion a year to the NFL. But the NFL is likely to get a larger deal if it opens bidding for its coveted Sunday Ticket in 2019, with ESPN and Amazon considered to be interested thanks to their respective streaming services. "I think the annual average value of the next Sunday Ticket deal could be twice the existing one." Forbes' Mike Ozanian wrote.